Silverstone Circuits has appointed Daniel Whittemore as sales manager of its conferencing, exhibition and event facility, The Silverstone Wing. Whittemore has worked for 12 years at the home of the British Grand Prix, for six of those managing the corporate sales team. In his new role he will is charged with creating a conference and banqueting team, which will drive sales and manage client relationships. The Silverstone Wing's conferencing, exhibition and event facilities, which opened in May 2011, have a combined floor space of 4,300sqm and can hold up to 3,500 people, while the pit garages offer event organisers an additional 5,768sqm of space. 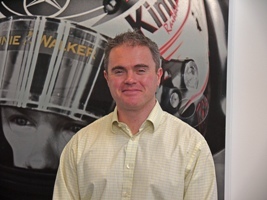 Whittemore said: "With six years of experience managing the corporate sales team at Silverstone, I’m thrilled to be appointed the new sales manager, conference and banqueting. "The wing is a fantastic new conference, exhibition and event facility, and is already generating considerable interest within the industry. This opportunity presents a new set of challenges and responsibilities which I’m looking forward to getting my teeth into."